Takeaway: World of Concrete's growing audience leads to an exciting and informative show. World of Concrete is a significant show, not just by the numbers, but for corrosion. More and more, talks are given and companies are offering their wares for products related not only protecting rebar inside concrete, but for helping with degradation issues of concrete itself. Nowhere else was this more evident than at this year’s World of Concrete Show. 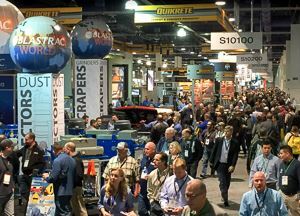 Held in Las Vegas, Nevada, attendance was up nearly 8% with more than 60,000 professionals attending; organizers state that this was the largest World of Concrete since 2008, including a 22% increase in visitors from outside the U.S.
For those in corrosion, not only were several papers delivered related to protecting concrete from the effects of corrosion, nearly 100 exhibitors were touting urethane or epoxy products for various concrete applications. Covering nearly three-quarters of a million square feet of both indoor and outdoor exhibits, the scope of the industry represented is stunning. On display, was a great deal of science surrounding the function of concrete. There are many talented people behind the development, production, installation, and coating of the world’s most widely used building material. All was boldly presented at the show. According to exhibitor and attendees talking to Corrosionpedia, the show was busy and highly productive. The event next year will again be held in Las Vegas, Nevada January 16 through 20, 2017.